The Force is strong this week with Star Wars fans, as May 4 and 5 are celebrated as “May The 4th Be With You” and “Revenge Of The 5th” respectively. With a brand new film slated for release in “Star Wars: The Force Awakens” this December, a lot of believers of The Force are anxious to see some juicy new details and stuff hailing from the new film that’s directed by J.J. Abrams. Well, they certainly got their wish, as Vanity Fair has released teasers from their upcoming new issue that spotlights Episode VII and gives a sneak peek at the old and new guards converging in a new adventure! 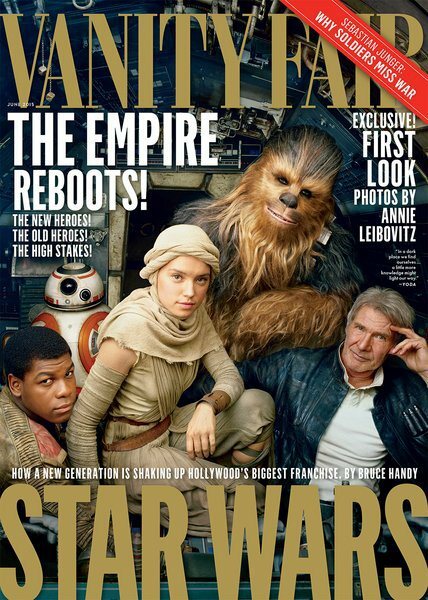 Here’s the cover to the latest issue of Vanity Fair, which spotlights The Force Awakens and shows some of the new cast in Finn (John Boyega), BB-8, Rey (Daisy Ridley), and classic heroes in Chewbacca and Han Solo (Harrison Ford). Shot by Annie Leibovitz, the June issue is set to hit newsstands on May 12, while a digital version will be out by May 7. Take a look at the production process of the cover, as featured in this video by Vanity Fair. 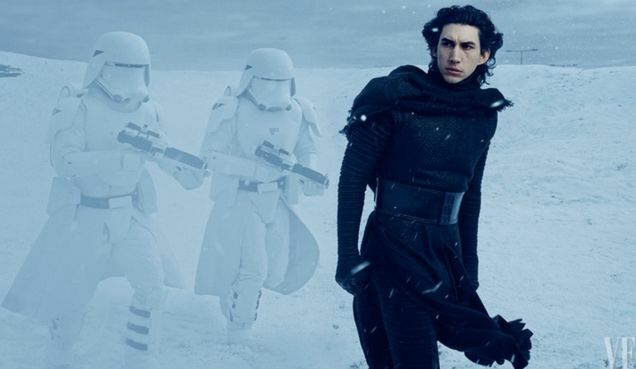 Also accompanying the feature were a few production stills, showing off Adam Driver as the unmasked Sith Kylo Ren and accompanied by Snow Troopers. Also featured were Maz Kanata and her Space Pirates. And there’s one with J.J. Abrams on set and directing a scene, which takes place in the sand planet of Jakku. Check out more stills and information on the upcoming Vanity Fair issue via their official website or through iO9. Star Wars The Force Awakens hits theaters on December 18, 2015.